Osbourne and his son, Jack, toured the life-size Noah's Ark replica as part of their show, "Ozzy and Jack's World Detour," according to the AiG blog. On Facebook, Ham confirmed the visit and praised God that the rock 'n' roll legend was exposed to the truth of the Gospel through the exhibit. 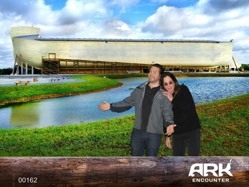 "Yes, Ozzy Osbourne visited the Ark Encounter and the TV program turned out well! We praise the Lord for all the opportunities He gives us to share the truth of God's Word and the Gospel with people around the world..."
Staff member Mark Looy revealed that the Osbournes were "very polite" to their staff as they walked in and around the park.